argggghh! wish I saw this before I ordered those max chips! Is this one verified? Can I use the NE555N instead of the NE555? I'm not aware if someone built this... So no. That's the same chip, so it's ok. Thanks miro! This is a HUGE help. Nothin' like savin' money! is it possible to use it as a bipolar supply? I mean using the second row as a +9 output. Yes. That's the way many would want to use inverters.. Just take +9V to circuit from row 2.
thanks for the help as usual! tested with a 5.20v supply, output is +5.20 -4.90. great! Made this and boxed it with a Sunface Ge and works great - voltage was a little low 7.5-8v but that's fine with the Sunface. What was you input voltage? I've been waiting to get this one tagged.. I too built this with the Sunface GE and am putting in 9.56 volts and it sends out -7.06 volts to the fuzz. I just tested this because you asked otherwise it sounds good. Could be a feature. Most fuzzes should be fine with -7 to -8 volts, but this probably won't be perfect solution for other applications. Do you know what frequency this is set to run at? About the offboard wiring, must we assume just to invert the led position? +1 on this question... But refering to the input/output jacks grounding. Should I use a specific side of the ground ... or ground is "ground" no matter what? Hi guys! Does anybody know if I could use this component instead of the ne555? Thank you in advance! 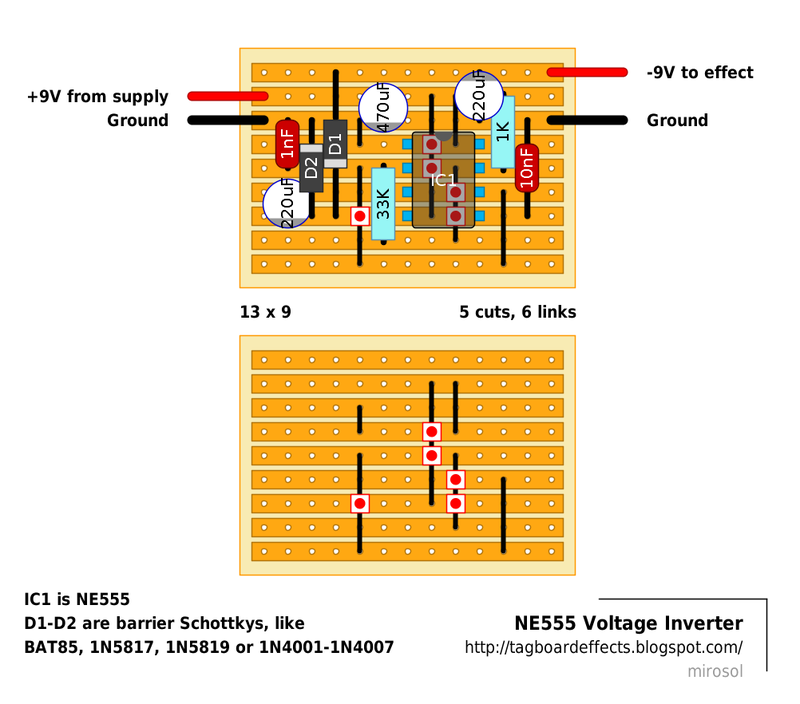 "Use a standard (bipolar) NE555 timer - not a CMOS type. CMOS timers do not have the switching abilities of the bipolar types, and output voltage will be lower." Works fine on my positive ground Parapedal! So much inspired with the documents you have shared. Thanks a lot, this was much useful and handy. Battery is the only source that assists to prevent us from the power demanding time, so choice of your battery should give at least minimum power consumption so better to buy your batteries & inverters from the battery authorized dealers. I built this but getting -3.9V - any ideas?